The provided bar chart depicts the estimated percentage of car trips taken between male and female in 2005 from eight different purposes. Most noticeably of all, it can be seen that work retains the highest estimated percentage of more than 50% for men and just under 40% for women. For women, shopping became the second highest estimated percentage for car trips with marginally below 20% whereas for men, it was recreation with just above 10%. With regards to the least estimated percentage, car trips for visiting town was least popular amongst the women with markedly under 10%. Men, on the other hand, have bank and running errands with roughly less than 5%. 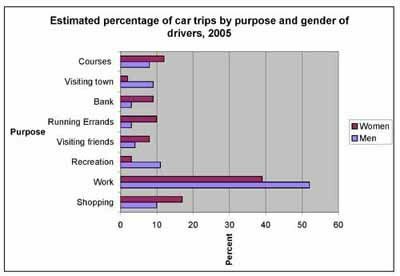 In summary, the most significant trend that we are able to draw out from the following bar graph is that both genders prefer driving cars to work rather than for other purposes such as visiting friends or running errands. The rest of the purposes were merely below 20% at most. Could someone correct the mistakes in my writing? Thanks a lot! Better analysis. No conclusion needed. It could be better analysed. There are still some salient points you can group together in one paragraph in this description. Lastly, you don't need a conclusion for task 1. Just describe the main features.